Lumatek digital ballasts get an upgrade with their new dimmable ballasts to allow greater flexibility in your growing area while reducing the cost of buying multiple ballasts. Ideal for when you want to avoid the heat of the summer months, if you need a boost for flowering or you want to establish young plants, these Lumateks are excellent value at less than the price of two compact ballasts with all the benefits of digital electronic ballasts. The manufacturer recommends only using specific lamps for specific settings - if you want to use the ballast at 400W then use a 400W lamp rather than turning down a 600W lamp, otherwise you will lose efficiency. Please also note that it is not possible to use Metal Halide lights with the Super Lumen setting, only Dual Spectrum and HPS lamps are suitable. 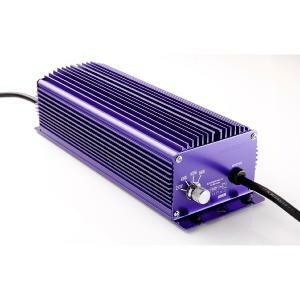 The 600W ballast can be adjusted to 250, 400W, 600W and 600W Super Lumen. To light a 250W lamp; set control to 250W. To light a 400W lamp; set control to 400W and dim down to 250W.